Black Wings [ACHUKAbooks] Today FREE – Tomorrow Full Price! 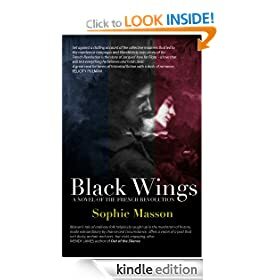 As a fifteen year old, Sophie Masson once wrote a short story called ‘Les Chouans’, which was her first attempt at trying to get to grips with the savagery, fear, courage and mystery of that time of Revolution, and the riven loyalties and terrible choices made by people on both sides of the civil war. Much later, she wrote an article, ‘Remembering the Vendée’, which has had many readers, but it wasn’t until many years later again that she first conceived the project of writing a novel about the tumultuous early years of the Revolution and the wars it unleashed. Framed by a prologue and epilogue set decades later, the main body of the novel is narrated by a young man facing execution in 1794, who tells his story and that of his friends, all from very different backgrounds. Masson succeeds movingly in giving the reader a feel for the way in which these things were experienced, not as great events, but as part of people’s lives, affecting them in myriad ways, both great and small. She evokes a portrait of a whole community, and of a country, caught in the grip of massive change, of rebellion and counter-rebellion and the havoc of war, whose echoes remain in the Vendée and in France to this day. via Black Wings [ACHUKAbooks] eBook: Sophie Masson: Amazon.co.uk: Kindle Store.